The nighties are and were a pretty rad time to have grown up in. Though, a portion of us were actually children of the eighties, we don’t remember it, so it would be the 1990’s that would become our first reference point of culture. And the first decade to come back around that we were part of, and able to feel again. I’m not sure if it holds a candle to being 16 in the seventies, but for those who remember wrapping their first plaid shirt around their waist or breaking in their first pair of 12 hole Dr. Martens, the nineties represented anti- something (anything) and breaking the mold. I don’t know if I actually loved Nirvana or the boys on the block did, but the images of Kurt Cobain and Courtney Love no doubt epitomized a look and feel of what was going on, and it was “cool” to be part of a group with shared commonalities. I was 12 in 1995 so I don’t think it gets more coming of age than that. However, it wasn’t all grunge. No Doubt’s Tragic Kingdom introduced me to the punk alter of Gwen Stefani, and logo’d Hilfiger was just a few beats around the corner. 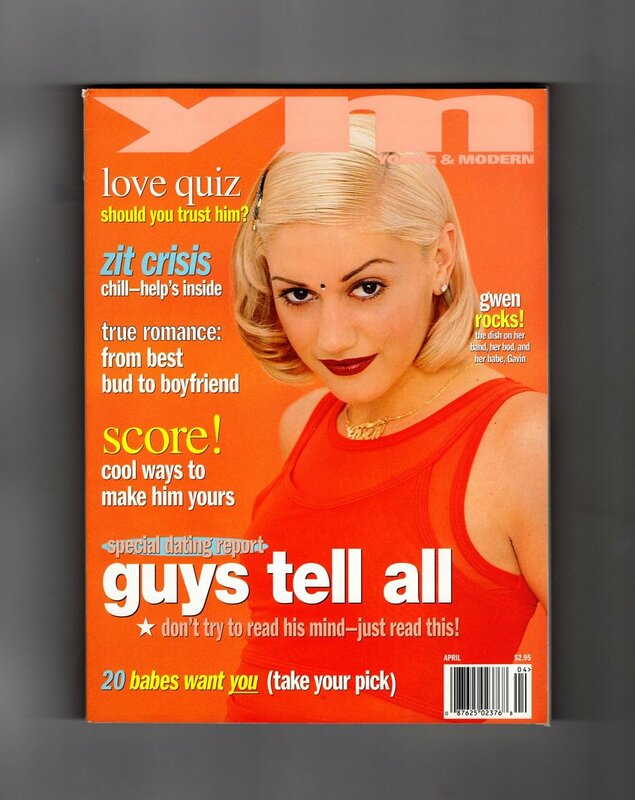 I read YM magazine religiously - Gwen had a cover that stands out in my mind, as does 90’s babe Drew Barrymore. The pages of these magazines were an education, a monthly Pandora’s box of lifestyle topics that made my pre-teen heart sing. We all bought CK One perfume and MAC counters started to pop up in local malls. Wet n Wild blue nail polish was hard to come by in Canada, though Revlon’s deep hued Toast of New York adorned everyone’s lips regardless of skin tone. Music and music videos offered portals into new places as they do for each decade of teens and pre-teens. For us we had Much Music and sadly not MTV, something we all loved watching when we travelled to the states. Momentarily reveling in what the youth of America got to watch on the regular! The Real World, angsty Daria, and Total Request Live. Hanging out with friends with no cell phones, no cars , and no money meant ample time in basements, trying to start a band, reading the lyrics in CD jackets, or trying hard to stay up to catch Saturday Night Live- most likely to see the musical acts. With no YouTube you had to do things the old- fashioned way or set the VHS tape to record. Music and the times no doubt influence fashion, funneling into movements that are branded in our memories – good, bad or ugly. Hello eighties! Thank god that was the decade I wasn’t responsible for my own shopping. The nineties were my own legitimate fashion choices though; jeans, Docs, plaid shirts, amazing slip dresses I wish I still had with cute baby tee’s underneath. The floppy hat a-la sitcom star Blossom was a favourite accessory, as were coloured sunglasses and basically anything from Le Chateau. The year 1995 also introduced us to the grand dame of teen icons Cher. Not that Cher. Cher with the epic closet and computer software to help make overwhelming sartorial choices easier for the Queen B. of Bronson Alcott High School. Clueless, one of the best teen films of all time, holds cult status to its legions of fans who can recite every words, and desperately searched for a plaid co-ord set. Well, I searched for that yellow kilt with knee high socks hoping my local mall would come through in my quest. I would then have to wear a kilt everyday during my high school tenure, slightly diminishing the light that burned bright for a Cher replica. The nineties are currently everywhere in fashion, and the nostalgia for the decade is causing a reboot in everything from style to sitcoms. The influence of this time is not only peppered in the clothing we see in the shops, but actual 90’s street wear is a hot commodity in re-sale and vintage. This time around though it is being sold via Instagram to people who were born in the new millennium. It’s still a mind f*ck that some people old enough to drive or vote have a 2 0_ _ on their birth certificate, and are walking around in actual Nautica pullovers from before they were born. But time does not stand still, the decades do come back around bringing with them new takes and old memories. I thought brazen Tommy Hilfiger logo’s were a thing of the past but slap one on a Hadid and tah-dah! The hip young things carry the torch forward thinking they are discovering it for the first time. But that is how this cycle works, a new generation gets to experience old cultural reference points updated with current sensibilities. And nothing could be truer than the announcement that Marc Jacobs is re-issuing his famous grunge collection for Perry Ellis that got him unceremoniously fired. Fashion-philes rejoice as Naomi Campbell is seen modeling the identical look from the SS1993 collection, and looking exactly like she did the first time around. As with any proper update of memory lane, Jacobs has tapped Gigi Hadid to bring it full circle in 2018. Remixing his famed aesthetic with a current style icon merging the old and the new. Everything that is old can been seen as new again, and I am ok to break in a brand new pair of Dr. Martens (this time cherry velvet with ribbon laces) and happily revisit slip dresses, and yellow sunglasses to relive a sentimental portion of my past.